Since I’m re-educating myself on Backbone.js, I thought this would be a good opportunity to Blog about the process I’m going through while re-learn Backbone.js again. In this post I will present the concept of Backbone.js Model. Based on past experience, I believe creating an application on Backbone.js there’s are few key concepts that should be understood: Model, View, Collection, Template and Router. 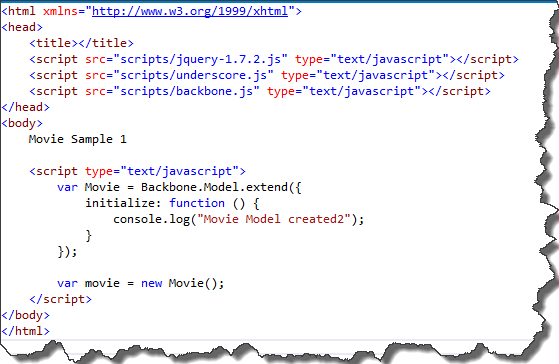 The code above is creating a Movie class from Backbone.Model.Extend. 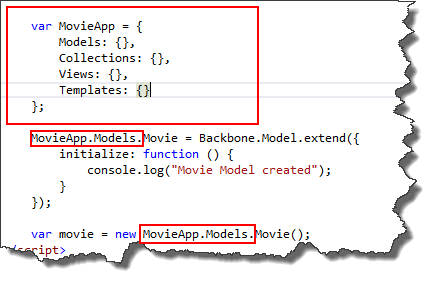 When an object is created from the Movie class the intialize function should be called and the message “Movie Model Created” should be written to the console. If you load this page in a web browser, I’m using chrome, the results should be displayed in the console. There is a problem here, everything is a global variable. Since we will be creating many Models, Views, Collections and templates, lets create a place to organize these structures. I’m by no means an expert in Backbone.js. I created this post because I had difficulty understanding backbone, and I hope that the information that I provide will help others grasp Backbone.js a little faster. This post is directed to individuals who understand the concepts of Backbone.js, but are having a difficult time implementing a simple solution. I’m probably not the best writer. It would take me days, if I were to validate all the grammar, spelling and such. So I’m just going to try to get it done. Even though the grammar and such may not be perfect, the technical parts of the article should be correct. I hope you enjoy. A few months after writting this post, my priorites and technology direction changed. For probably 6 months I did little work with Backbone.js. When I came back to Backbone.js in November, I was a little lost. I had to become familar with the technology once again. I thought it would be a good opportunity to write about Backbone.js basics. Here are posts where I describe the basics of Backbone.js. This post will be based on a contrived idea of displaying a list of movies at a theater. I have a web page that calls a Web Service. The Web Service returns HTML. This HTML need to be updated in the web page. This is a fairly easy process in IE: obj.outerHTML = new HTML. But, I also need to get this to work in Firefox. At first I had a difficult time creating a solution, but after a little Googling and understanding range and createContexualFragment the pieces started to fall together. This is what I came up with..
How to read inner/outerHTML with NN6? I don’t know why it’s "String.IsNullOrEmpty" instead of "String.prototype.IsNullOrEmpty", but it works. Maybe someone can answer this for me. There are problems with FireFox using onload. Most of the documentation and articles that I have read identifies that FireFox does not support onload. I currently have FireFox 3 installed and onload seems to work. But I have not been able to test onload on previous versions of FireFox. I’m probably going to have to implement a solution for previous version of FireFox. I have found some good reference of doing onload with previous version of FF, but do not have time to implement it right now. I’m just going to put the references here so I can find them later. The ASP.NET project that I’m currently working on uses AJAX to save data to a Web Service. The web service is generic. The web page should be able to pass address, phone numbers, sales info and etc to the web service. Base on the key that is also passed to the web service, the web service should know how to save the data. The first version of the client code that called the web service gathered all the data from the form and created a string that was pipe delimited. Example: key=person|keyid=333323|firstname=John|lastname=Handcock. When this information arrives at the web service it must be parsed and saved. A lot of red flags seem to pop up with this design. I tried to create an array that accepts an NameValue object and pass the object to web service, but this errors when I call the web service. I finally figure out I could do the following and pass the object to the web service. 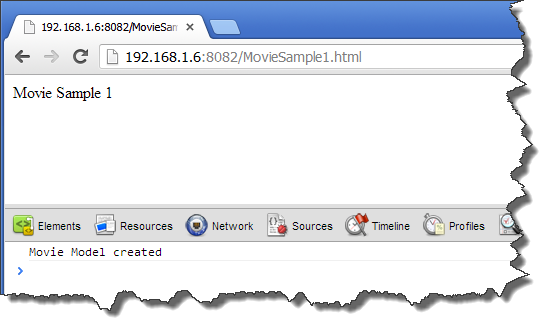 On the current ASP.NET project that I’m working on, I’m using AJAX to save the user input to a WebMethod(WebService). While the save is running the user needs to be prompted that their data is being save. At this time the user should not be able to do any other action on the page until the save has completed. Below are the resource that I used to solve this problem. All the resources but the first were fairly complex. The first resource did a very good job of solving my problem. I listed the other resource because they provided some additional information. I’m in the process of create a few input forms in ASP.NET (Name, address, and etc). If the user makes a change to the page and tries to navigate away from the current page without previously clicking save, the current page should prompt the user that there are changes to the page and does the user want to continue to navigate to a different page. The prompt should be triggered by any of the following: selecting a link, closing the window, entering a new URL in the address bar, selecting back, hitting refresh or other means. To solve this problem I first tried using onunload, but could not find any way of stopping the user from going to another page. As you can see in the following code the window.onbeforunload is set to ConfirmExit function. This is the part that is used to notifies the user. Any time the user tries to exit the page the ConfirmExit function will be called. In the ConfirmExit function, if the isDirty variable is true, the user should be prompted with a message to confirm if they want to leave the page. If isDirty is false the the user is redirect without a prompt. If the user clicks save button, I do no not want him to be prompted that the data has not been save. So I set the following for the button control. IE runs onbeforeunload twice for no reason?